A small brown butterfly, with a thin black line followed by an orange band and white lines, that form the letter W on the hind under-wing. Where: Through-out Southern and Central England. Habitat: Woodland rides and hedgerows with Elm trees. When: Flying where found in largest numbers from July – August. Larval Food Plant: The blossom and early buds of Elm trees. Adult nectar Plants: When not in tree tops adults may nectar on Bramble Flowers, Wild Marjoram (Origarnum vulgare), Thistles. 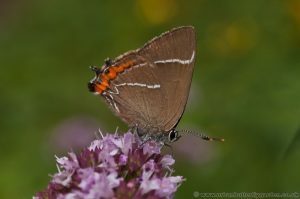 Population Status: Due to loss of habitat and falling numbers the White-letter Hairstreak is a priority species for conservation.